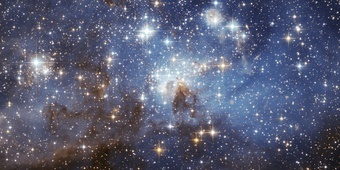 Light pollution affects the visibility of stars. Building a simple Magnitude Reader, students determine the magnitude of stars and learn about limiting magnitude. Why does the Moon not always look the same to us? Sometimes it is a big, bright, circle, but, other times, it is only a tiny sliver, if we can see it at all. The different shapes and sizes of the slivers of the Moon are referred to as its phases, and they change periodically over the course of a lunar month, which is twenty-eight days long. The phases are caused by the relative positions of the Earth, Sun, and Moon at different times during the month. Students work in teams of two to discover the relative positions of the Earth, Sun and Moon that produce the different phases of the Moon. Groups are each given a Styrofoam ball that they attach to a pencil so that it looks like a lollipop. In this acting-out model exercise, this ball on a stick represents the Moon, the students represent the Earth and a hanging lightbulb serves as the Sun. Students move the "Moon" around them to discover the different phases. They fill in the position of the Moon and its corresponding phase in a worksheet. The Sun moves across the sky at an approximately constant rate because of the rotation of the Earth. By measuring how fast the Sun moves, you can work out how big the Sun appears in the sky. All you need are some household items and about 30 minutes on a sunny day. The activity is an observational lesson in the phases of the moon with an attached calendar and video links. Students are introduced to the futuristic concept of the moon as a place people can inhabit. They brainstorm what people would need to live on the moon and then design a fantastic Moon colony and decide how to power it. Students use the engineering design process, which includes researching various types of energy sources and evaluating which would be best for their moon colonies.